Few conquests have been as devastatingly final as the annihilation of the legendary kingdom of the Incas. In under 40 years after their first encounter with Francisco Pizzaro in 1532, the Incas were history. Their gold looted, their religion wiped out and their architecture demolished. With the exception of Machu Picchu and a few other uninhabited ‘lost’ abodes that the conquistadors were unaware of, almost all of their cities were completely destroyed. The only witness to their existence: the vestiges of their exquisite stonework in the foundations of colonial buildings. 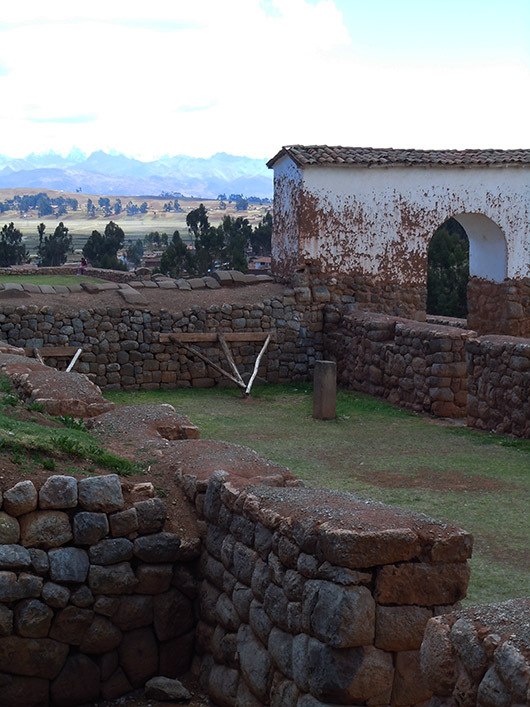 Main plaza, Cinchero: Colonial church with incan stone foundation walls. The trapezoidal niches probably held idols. On a weekday the main square in the village of Cinchero was evocative of this tragedy. Empty and spookily silent like a deserted frontier town. 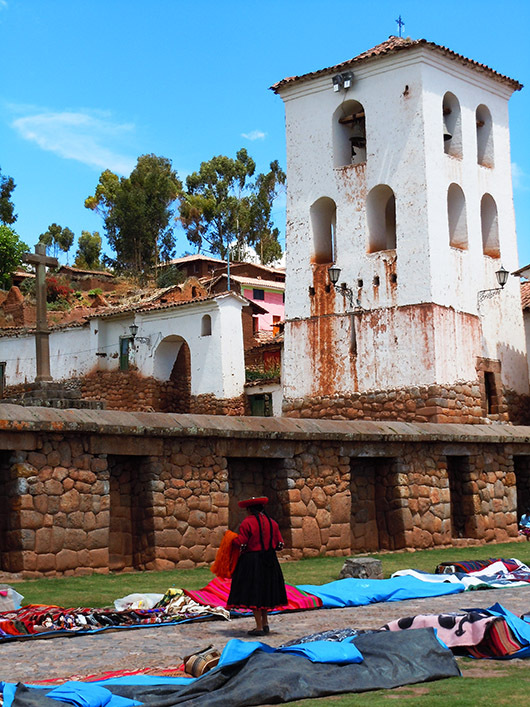 The square is dominated by a 16th century church dedicated to “Our Lady of Montserrat of Chinchero”, constructed on top of a former Incan palace. Spare and simple on the outside, the interior is beautifully decorated with an ornate ceiling and large oil paintings by Quechuan artists. Our guide pointed out the heavy symbolism in the artwork covertly depicting native religious symbols in the shapes of the Virgin’s robes and the mountains beyond, that somehow escaped the eyes of the “idolatries extirpators”, as it would have ours! Adjacent are more stone walls, and arenas where young Incan boys would fight mock battles to mark their passage into adulthood and to train to become warriors. Most of this is deduced from ancient lore passed on in an oral tradition, for they did not leave behind a written language. The rest is pieced together from the works of Spanish historians. We were initially disappointed about having missed the Sunday market. But in the end we were glad we came on a quiet day when we could sit in the middle of the square with nary a soul in sight and listen to our guide’s passionate narration of the fascinating stories of his ancestors. Until next time……..happy travels, no matter where life takes you. Beautiful photos. I remember studying the kingdom of the Incas’ way back in elementary school. Your post makes me want to refresh my memories on the subject more. Vivid colors. Having a guide who is passionate about his culture and history just made the experience all the more valuable. Thanks for sharing this history. Great posts as always.Amazing photo. Thank You for sharing and be blessed! What a fascinating place, and I love the colours. That’s terrific Madhu, and beautifully shot, as always. Thank you. Glad you liked it. Your Meemure post was unforgettable. Fascinating and informative. A great historical photo tour! Each picture tells its story … Thank you for the wonderful post, Madhu! Hi Madhu, these are really lovely photos, and the storytelling is great. Love the history lesson, Madhu; and the photos are beautiful too! Fascinating history….I love the vivid colors of your photos! You do Indra 🙂 There is so much to see in South America. The distance is offputting though. We haven’t done Australia either. Beautiful photos and background history of a civilization that was nearly wiped out. It’s terrible how much culture, history, information is lost when a new power tries to erase what existed before them. The same has happened in the Americas (when the explorers first came to its shores), ancient Egypt and many other places. I envy the way you post your travels. So much to this place worth mentioning. You totally did an outstanding job sharing it to us. It is wonderful photography, I felt as if I visited those places directly. Superp. Thank you Shanthi. I am not able to link to your Gravatar. Are you a blogger? What a great post, Madhu! Thank you for such beautiful shots and info! A very thought provoking post…this bit of history is depressing, but so very important to remember. I really think so TBM. I always feel sad about all that we have lost. Interesting post that I enjoyed reading. Oh boy! Amazing pics & facts! Now I reeeeeaaaaally can’t wait for my trip to Peru! Thank you Zoe 🙂 When do you leave for Peru? The church was even more beautiful inside AD. Yes, good guides are a huge asset on these trips. Beautiful photos…having lived in South America, it also brought back some poignant memories. Thank you for sharing. Thank you, and welcome to my blog 🙂 Did you live in Peru? How wonderful! We so wanted to go to Cartagena, but only had so much time. Someday hopefully……. The history itself is well worth a visit. It’s a beautiful place…very HOT! But beautiful and I found the people to be really wonderful. 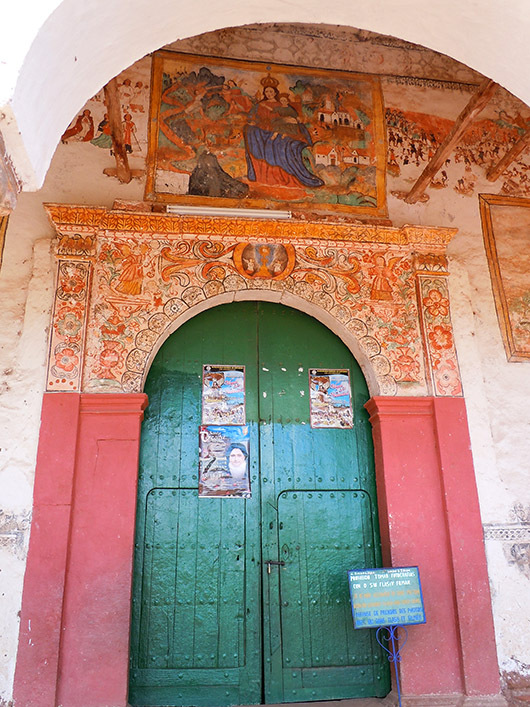 Amazing the layers of history, Madhu: the 16th century church on the Incan base. The very thought of the battles in that arena is incredibly evocative. Thank you, once again, for a beautiful post! Brilliant photos Madhu! Great writing too! Oh thank you Mimo! Apreciate that. Exquisite post, Madhu — both photography and essay! I didn’t realise I was reading a Sunday post entry till I got to the end Madhu. I was simply engrossed in the pictures and the story. Wow, I love civilizations with a deep history and interesting cultural roots. Thanks for sharing! Me too 🙂 Thank you for your visit and comment. You are very welcome, Madhu. I had been following your blog but realized I was not receiving emails of new posts. I think I have figured it out so I will now receive them. I have some catching up to do! I love your photos and descriptions of the Incan plight. We spent a year in Mexico and took an 8-day took of many archaeological sites and found them all to be fascinating. Looking forward to reading more of your posts!